Why average cats should not compete with the master, Maru. Humph! That Maru has his/her situations set up by her/his faithful human companion/production gofer. This OTOH is the genuine, un-stagemanaged work of a daring young neophyte, willing to take chances, even to look silly, in order to advance the Art Form! Props where they’re deserved! Suedoise2 – you make a compelling argument. Perhaps we can say it is an early performance piece showing promise for the artist’s vision. Glad we agree. 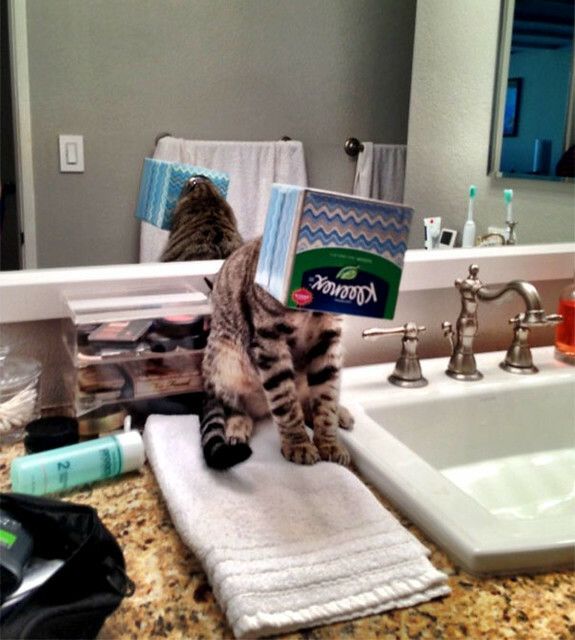 I particularly note the subtle commentary inherent in the upside-down orientation of the tissue box, and the courage shown by the young performer in effacing his identity — not to mention the problem of getting the box off his head without the aid of opposable thumbs. Bold! A talent to watch, definitely. Kitty is in the process of discovering that box is, indeed, too small for his bod.